Whether pondering black holes or predicting discoveries at CERN, physicists believe the best theories are beautiful, natural, and elegant, and this standard separates popular theories from disposable ones. This is why, Sabine Hossenfelder argues, we have not seen a major breakthrough in the foundations of physics for more than four decades. The belief in beauty has become so dogmatic that it now conflicts with scientific objectivity: observation has been unable to confirm mindboggling theories, like supersymmetry or grand unification, invented by physicists based on aesthetic criteria. Worse, these "too good to not be true" theories are actually untestable and they have left the field in a cul-de-sac. To escape, physicists must rethink their methods. Only by embracing reality as it is can science discover the truth. Sabine Hossenfelder is a research fellow at the Frankfurt Institute for Advanced Studies and the author of the popular physics blog Backreaction. She has written for New Scientist, Scientific American, and NOVA. She lives in Heidelberg, Germany. "According to the physicist and prolific blogger Sabine Hossenfelder, Einstein and others who work in a similar way are 'lost in math,' the title of her lively and provocative book." 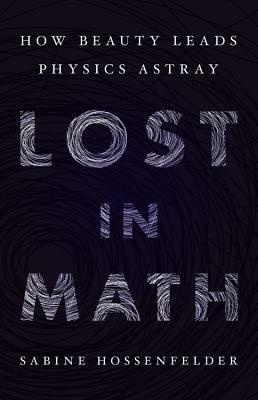 "In her new book, Lost In Math, Sabine Hossenfelder adroitly confronts this crisis head on.... The book is a wild, deep, thought-provoking read that would make any reasonable person in the field who's still capable of introspection doubt themselves." "Sabine Hossenfelder's new book Lost in Math provides a well-informed take on the current situation in fundamental physical theory. The author is completely honest, utterly fearless, and often quite funny." "[Hossenfelder's] critical assessment of the field is appropriately timed." "Eavesdrop on accessible and frank conversations in Hossenfelder's Lost in Math, which wrestles with big questions of quantum mechanics and beauty in a fun, fascinating way." "Hossenfelder's jaunt through the world of theoretical physics explicitly raises the question of whether the activities of thousands of physicists should actually count as 'science.' And if not, then what in tarnation are they doing?"